The Kilner range includes all of the equipment you will need to start the brewing process. 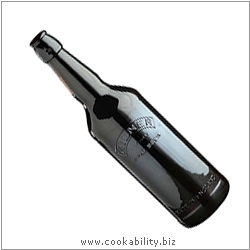 The Kilner Home Brew bottles are made from high quality half recycled amber glass. Complies to British glass TEC which includes BSEN 1507459 thermal shock. The glass wall thickness allows for secondary fermentation and will withstand internal pressure of 174PSI. The dual lid system allows for swing top lids and crown caps to used on the same bottle. Please order in sixes to ease packaging requirements.